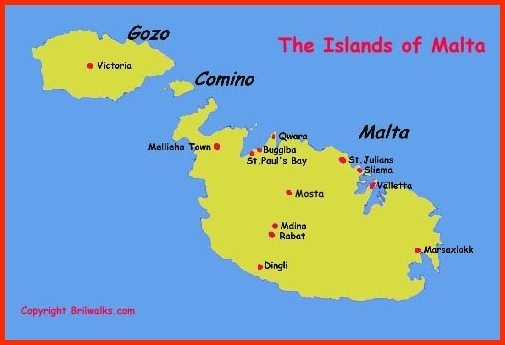 Some walks on Malta with pictures and brief information about various places on the islands. Many people who have visited Malta tell me that you either love or hate it. I wouldn’t say I love it, I certainly don’t hate it, but I do like it very much. 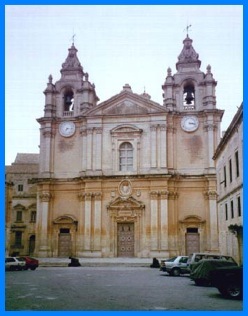 had finished up in Sliema, which is, I suppose, the "posh" part of Malta, and located close to Valletta, the capital. After this first visit Anne had said "never again". 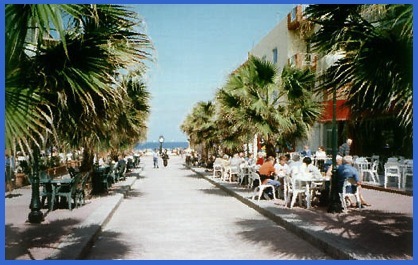 But, as we couldn’t find a suitable holiday on Majorca in March 2000 either, we again finished up in Sliema. Anne, as previously was not impressed. Malta again. 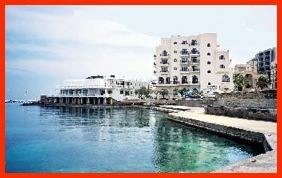 Stay further north of the island at St Paul’s Bay and selected the Gilleriu Harbour Hotel for our two week stay. And guess what ? – Anne loved it and wanted to go back again. Although the walks to the north of the island relate to the 2003 holiday I have placed information/photographs about some of the places we visited in 1999, 2000 as well as 2003. As usual click the titles for details. Anne and I were told by staff at the Guilleru Harbour Hotel, which is located in Paul's Bay, that in the summer months this area is very very busy and would not be the place for a quiet holiday. Back in September 2003 I spoke to two of my tennis playing friends, Chris S and Barry F. They told me that they had been to Malta one summer back in the 1970's. They had enjoyed their holiday but were unable to remember visiting any places and certainly did not do any walking. Alcholic amnesia? Yes, you've guessed it. They stayed in Buggiba and spent most of the day - probably all of the day - in one of the numerous bars in the town. 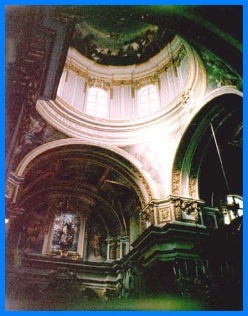 However, in late March/early April 2003 it was wonderful. 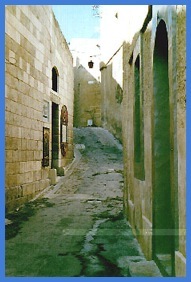 On a number of occasions we walked from St Paul's Bay to Buggiba and on to Qwara. Often we would enjoy the facilities of a local café or hotel and can only give thumbs up to this area in Spring. A very pleasant spot to enjoy a drink and watch the world go by. A view of the beautiful little harbour to the west of the Guillieru Hotel. 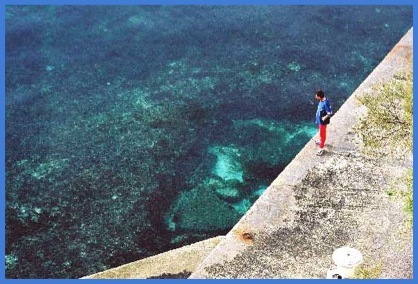 The water around Malta is so clear. Another view from the Guillieru Harbour Hotel. 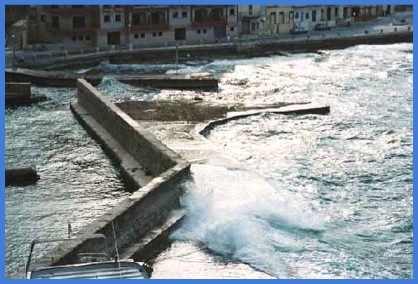 Yes even in Malta the sea can get rough. 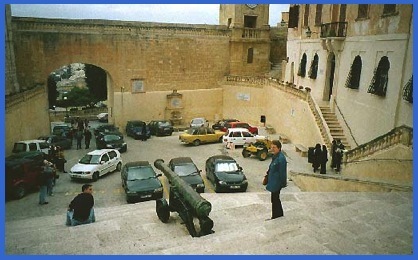 Gozo, the larger of the two islands to the north of Malta, is easily reached by the ferry service, which goes between the islands about every 30 minutes. 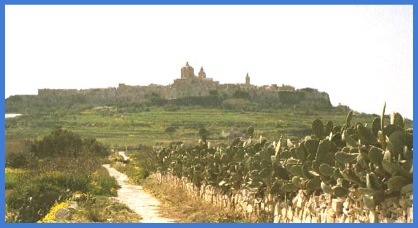 The island is a lot less busy than Malta and the countryside is generally less rugged and more cultivated - much of the fruit and vegetables enjoyed on the main island of Malta comes from Gozo. Looking down on Mgarr, the ferry terminal on Gozo. 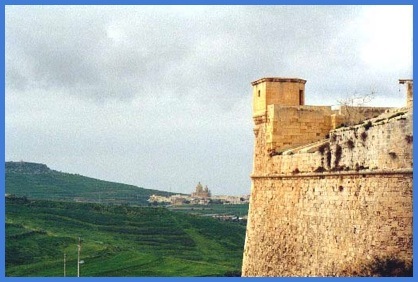 My favourite place on Gozo has got to be the Citadel, located in Victoria, the capital of the island. 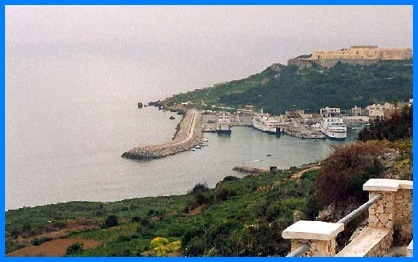 From the ramparts of this fortification it is possible to see most of the island. Inside the Citadel, complete with a yellow Morris Marina car - exactly like Barry used to have. Part of the wall of the Citadel, viewed from the Citadel. The open air café in the square in the middle of Victoria is also worth visiting and is an ideal spot to enjoy the sun and watch the world go by. But I was so busy watching the world go by I didn't take a picture. Valletta, with the sun making the sea sparkle. I don’t like cities. Generally they are too busy, noisy and dirty. But I do like Valletta. It has got to be my favourite city. It’s small. I like the grid layout of streets. The traffic is minimal. The main thoroughfare, Republic Street, is a traffic free zone, and is a joy to walk, although Anne does stop occasionally to look in one of the many jewellers shops. The city has water on three sides. It’s built on a mountain, Mount Sceberras – but it’s not very high. In fact Republic Street must be somewhere near the top of it. Added to the above are wonderful gardens and views that are excellent. It’s a must to visit. 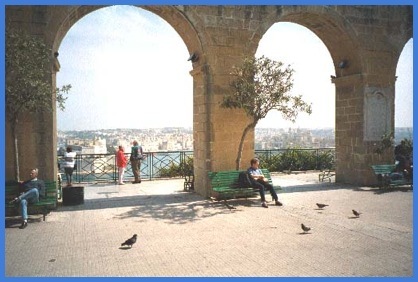 Anne, resting in the Upper Barrakka Gardens, with the Grand Harbour and the Three Cites in the background. 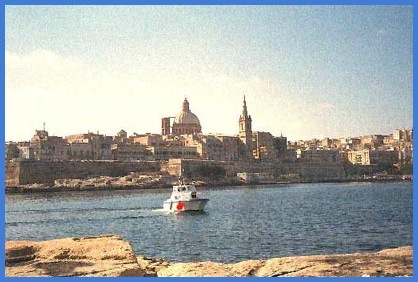 This is area of Valletta, which is the terminal for the Sliema - Valletta Ferry. 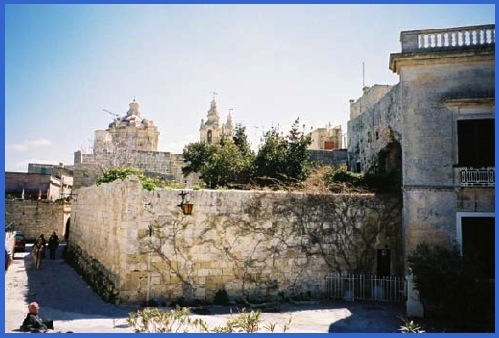 You can also see tops of two of the 365 churches that have been built on Malta. 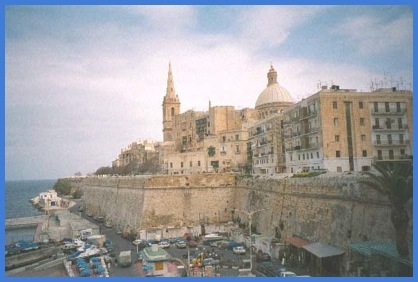 The south side of Valletta viewed from near the Upper Barrakka Gardens. This shows why Malta is one of the most densely populated countries in the world. View of the Grand Harbour and the Three Cities from the Upper Barrakka Gardens. 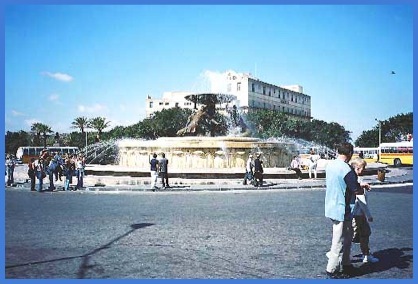 It would seem wrong to have pictures of Valletta without a "snap" of the fountain in the middle of the bus terminal - However, it should be noted that the terminal is outside the city so it is actually in Floriana. 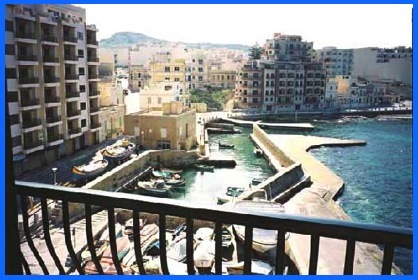 The two best things about Sliema are its views and its location. 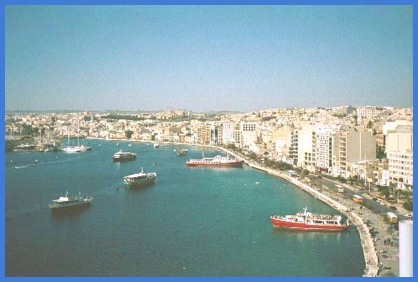 Below is a wonderful evening view, from the top of the Marina Hotel in Selima, across the water to Valletta. we enjoyed when we stayed at the "Marina" in March 2000. 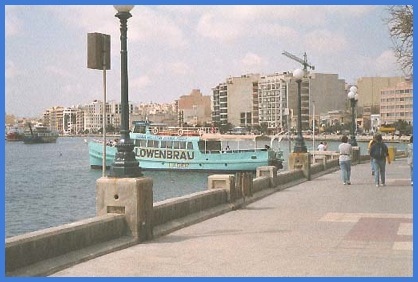 Above, moored at its berth in Sliema is the ferry, which is a quick and inexpensive way to get to Valletta and back. In the background is the inevitable crane indicating yet more building work in progress. Although we spent our first two holidays in Malta in Sliema we definitely prefer the comparative tranquility of the north end of the island and St Paul’s Bay to the hustle and bustle of Sliema. 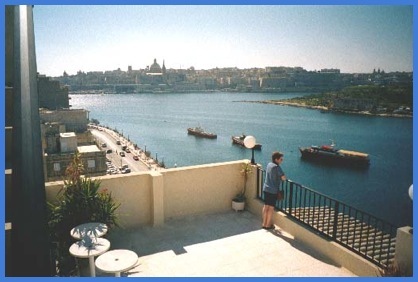 Nevertheless views across Sliema Creek to Valletta are superb and it is an excellent centre to use the bus service to get to all parts of the island. 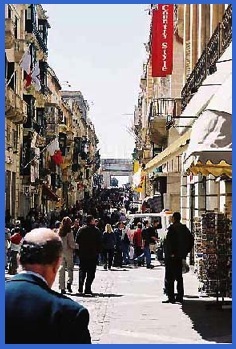 However, it’s not an ideal walking location, although we have often enjoyed strolls between the Sliema and both Valletta and St Julian’s Bay, which is located along the coast to the north. 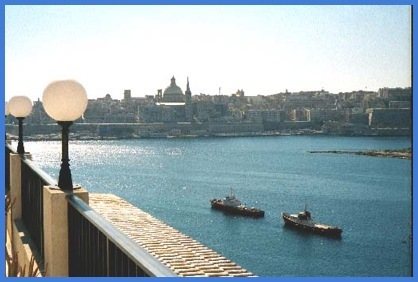 Here are details of a walk from Valletta to Sliema and on to St. Julian's Bay..
Selima - The view of the town's seafront from the top of the Marina Hotel. 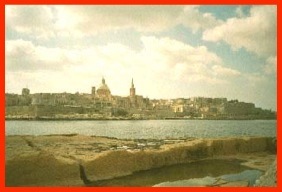 Above and below - Two more views of Valletta from Sliema. 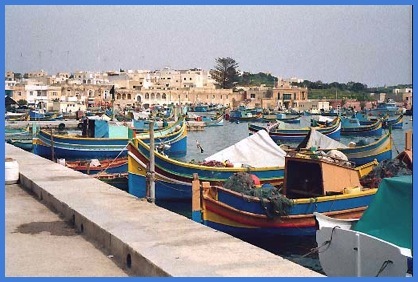 Marsaxlokk is one of the most picturesque and photographed places in Malta. Situated on the south coast of the Island it is noted for its harbour and the colourful fishing boats that use it as their base. Colourful boats in Marsaxlokk Harbour. 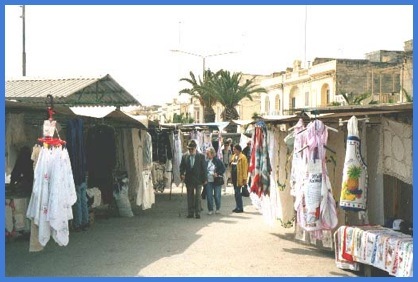 The market adjacent to Marsaxlokk Harbour. Almost every day there is a market on the harbour side, but the vast majority of stalls are aimed at visitors and you are unlikely to find anything different to wares sold on other parts of the island. But if you have half a day spare it is an enjoyable experience. many invaders that have "visited" this island. As per usual in such historical places there are the usual quota of shops and restaurants. Rabat is quite ordinary in comparison but as we have discovered in the past it has some lovely little bakeries and it is very pleasant to sit in the town square enjoying a Maltese Cake and watching the world go by. We seem to watch a lot of the world go by when we are on holiday. The above view is of the walls and cathedral in Rabat. Located to the east of the island Dingli Cliffs are very dramatic. 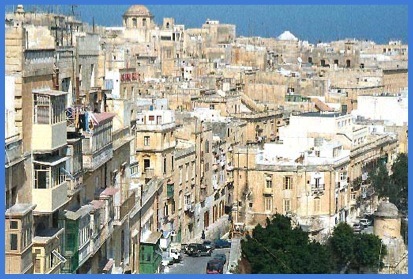 We visited them on a cold day – or at least a cold day for Malta – and we were glad, like other people we saw, to admire the views from a nearby café. Yes - another photo opportunity missed. 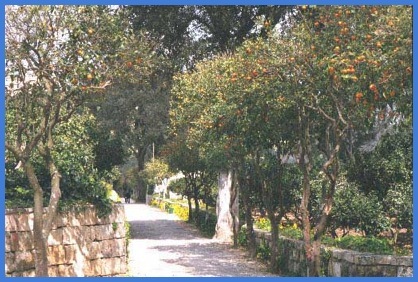 Oranges trees in March in Buskett Gardens. prehistoric cart tracks; or at least the gouges in the limestone rock are referred to as cart tracks. Like most people I have no idea what they really are or how they came in to being. If you do visit this area beware as, unless you are very lucky, you may be accosted by a local who will bore you to tears with his theories. You may have to be rude to get rid of him, so be warned. The people of Malta are also football crazy and have a deep affection for most English teams, especially Manchester United! 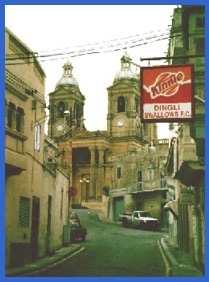 In most towns and villages you will find football pitches and clubs, many, like this one at Dingli with its own "Pub".